Multi Player Roulette is a brand new game from Microgaming which has been launched to join their live dealer games. This game unlike any other Roulette game offered before lets you play with up to 7 players betting on the same wheel using the same betting grid. In order to understand how the multi Player Roulette game works, you first need to understand the game of Roulette. Roulette is an established casino game which has been around for centuries and is based on the concept of where a moving ball comes to rest in a spinning wheel. The wheel is made up of 36 different pockets of black and white with different numbers in them plus a single zero pocket or double zero pockets depending on which version of Roulette you are playing. 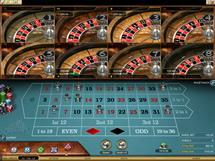 The single zero pocket game is known as the European Roulette wheel and the double zero version is known as the American Roulette game. This new multi player Roulette game is played on the European wheel. When Playing Roulette there are two main types of bets, the inside bets and the outside bets. Inside bets are bets placed on the inner betting grid and are made up of smaller groups of numbers or individual numbers and these bets have names such as street bet, corner bet and split bet on two numbers. Bets on larger groups of numbers are known as outside bets and these are on the outer betting grid and can be made up of groups of numbers such as odd or even numbers, black or white numbers and so on. When playing Multi-Player Roulette games you can join a game that is fed via High Definition directly from the Microgaming studio to your computer. Up to seven players can join in the game at once and bet on different or the same numbers. Each player is distinguished by different color chips so that you can see where the other players are placing their bets. This is all fed through the special action cameras which feed information to each player that has joined the game. Playing Multi Player Roulette is more competitive than other games just from the point of view that you can see what other players are doing and of course this game is much more fun. You can arrange to play Multi -Player Roulette with your friends and enjoy a great game together with a lovely social atmosphere. Multi Player Roulette is only one of a number of different live dealer games which you can find at Microgaming casinos where you really feel part of the whole game and scene and can be totally involved. This is definitely the way forward and if you enjoy Roulette you will love this Multi Player Roulette game.